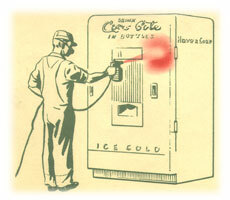 The Soda Jerk Works provides outstanding craftsmanship and quality restorations for a variety of components for Collectible Soda Machines. We expect any restoration professional to do what should be done to insure a long lasting restoration with minimal maintenance. New insulation. The better insulated it is the more efficient your original cooling system will be. Bottle or can stack and shelves zinc plated or powder coated as long as it is done correctly. If applied incorrectly it can interfere with tolerance and function. Coin mechanism restored and functioning properly. Rewiring with soldered connections (not wire nuts and electrical tape). Compressor work - fan motors and thermostat should be changed. We advise keeping as much of your system as original as possible. Every detail should be addressed including the hardware! When looking for a restoration professional be sure to check out the quality of their work and get referrals.